Aim: The aim of this study was to evaluate the shear bond strength (SBS) of self-adhering flowable composites on the dentinal surface prepared with carbide and diamond burs. Materials and Methods: A total of 64 extracted mandibular molars were mounted on acrylic resin blocks, and the coronal part of the dentin was exposed and polished. Then, they were divided into Group 1 and Group 2 for carbide and diamond bur preparation, respectively. Two teeth in each group were evaluated under scanning electron microscope, ×500, to view the surface changes following the bur preparation. The remaining teeth were subdivided into Groups A, B, and C to be restored with Constic, Dyad™-flow, and Tetric N Flow composites, respectively. Then, the specimens were stored in distilled water at 37°C for 24 h, and then subjected to universal testing machine to evaluate the SBS and viewed under light stereomicroscope to evaluate the type of failure. Statistical Analysis: SPSS version 22 (IBM Corp) for Windows was used for statistical analysis. The values were subjected to ANOVA followed by Bonferroni post hoc analysis. The values between the groups were analyzed using Student's unpaired t-test. Results: Statistically significant differences in the SBS values were seen between Groups A and C (P < 0.001) and Groups B and C (P < 0.001). Statistically significant differences were seen in SBS values of Dyad-flow (Group B) (P < 0.004) and Tetric N flow (P < 0.007) for surfaces prepared with carbide and diamond burs. Conclusion: It was concluded that the SBS of Tetric-N Flow was higher than that of the experimental groups of Constic and Dyad-flow. Dentinal surface preparation with carbide bur resulted in higher SBS for Tetric N Flow and Dyad-flow but not for Constic. A total of 64 extracted third molars were collected and stored in normal saline. The teeth were mounted on acrylic resin blocks and the coronal one-third of the crown was sectioned exposing the flat dentinal surface and was polished using 600 grit silicon carbide abrasive paper. Then, the teeth were divided into two groups 1 and 2 of 32 teeth each. The samples of Group 1 were prepared using fissure carbide no. FG8642G (SS White) and those of Group 2 were prepared using coarse taper round end diamond bur SSW-TR13C (SS White). [Figure 1] shows dentinal surface prepared with fissure carbide bur and [Figure 2] shows dentinal surface prepared with coarse diamond bur. For preparation of every five samples, a new bur was replaced by a high-speed hand piece with air–water spray, with a maximum speed of 3,40,000 rpm and an air pressure of 27 psi. The preparation was carried out for 10 sweeps of the bur in a single direction and a controlled pressure of hand on the dentinal surface. The remaining teeth in each group were subdivided into Group A, Group B, and Group C. In Group A, 0.5 mm thickness of Constic, (DMG, Germany), self-adhering flowable composite resin (SAFC), was dispensed with the aid of the Luer-Lok™ syringe and massaged for 25 s using the supplied brush. Excess, if any, was removed and light cured for 20 s. Then, the material was layered in increments of 2 mm and 1 mm to prepare 3-mm composite discs on the dentinal surface. 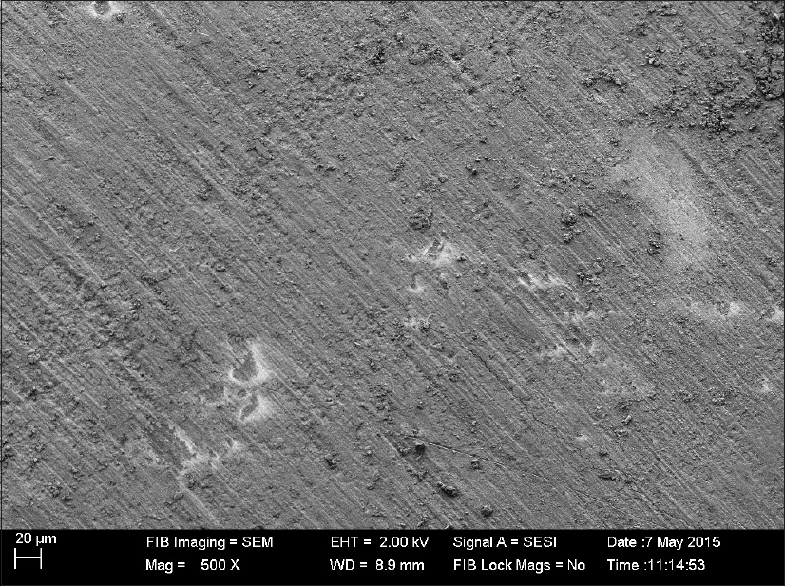 In Group B, 0.5 mm thickness of Dyad™ flow (Kerr) SAFC was brushed with moderate pressure for 15–20 s to obtain a thin layer, and then the excess material was removed and light cured for 20 s. Then, the material was layered in increments of 2 mm and 1 mm to prepare 3-mm composite discs on the dentinal surface. In Group C, Tetric N Bond (Ivoclar Vivadent) self-etch adhesive was applied on the dentin surface and restored with Tetric N Flow (Ivoclar Vivadent) composite resin to prepare 3-mm disc and light cured for 15 s.
Where mm2 is the total surface area of the bonded composite. The Statistical Package for the Social Sciences version 22, IBM Corp, Armonk, IL, Chicago, USA, for Windows, was used for statistical analysis of data using ANOVA followed by Bonferroni post hoc analysis. Comparison of SBS between groups was analyzed using Student's unpaired t-test. Results with P < 0.05 were considered statistically significant. The bond failure modes were evaluated using a light stereomicroscope (Zeiss stereo Discovery. V20) under ×20 magnification and classified as cohesive, adhesive, and mixed failures. All the three groups in carbide bur (Group 1) preparation showed higher SBS values than the same groups in diamond bur (Group 2) surface preparation. Group C showed the highest SBS value followed by Group B and then Group A.
Statistically significant differences in the SBS values were observed between Groups A and C (P < 0.001) and Groups B and C (P < 0.001) as shown in [Table 1]. [Table 2] shows statistically insignificant difference (P = 0.116) in SBS values of Constic (Group A) for surfaces prepared with carbide (Group 1) and diamond (Group 2) burs, with statistically significant difference (P < 0.004) in SBS values of Dyad flow (Group B) and Tetric N flow (Group C) (P < 0.007) for surfaces prepared with carbide and diamond burs. The higher bond strength values showed predominantly mixed failure, whereas lower bond strength values showed adhesive failure. The clinical outcome of dental restorations bonded to dentine is dependent on the hybridization of adhesive resins into partially demineralized dentine. Any tooth surface preparation with the rotary instrument generates smear layer. Gwinnett has reported that the thickness of the smear layer depends on the type of the bur, the use of water spray, and the speed of the instrument. SAFC combines the etching, bonding, and restorative procedures in a single step, thus simplifying and reducing the chairside time to the clinician and the patient. In this study, two self-adhering flowable composites, Constic and Dyad flow, and one conventional flowable composite, Tetric N Flow, were used to compare the SBS. In this study in carbide fissure group, all the flowable composites gave higher SBS values than that of the diamond group even though it was not statistically significant in Constic group, this is in agreement with the findings of Ogata et al. 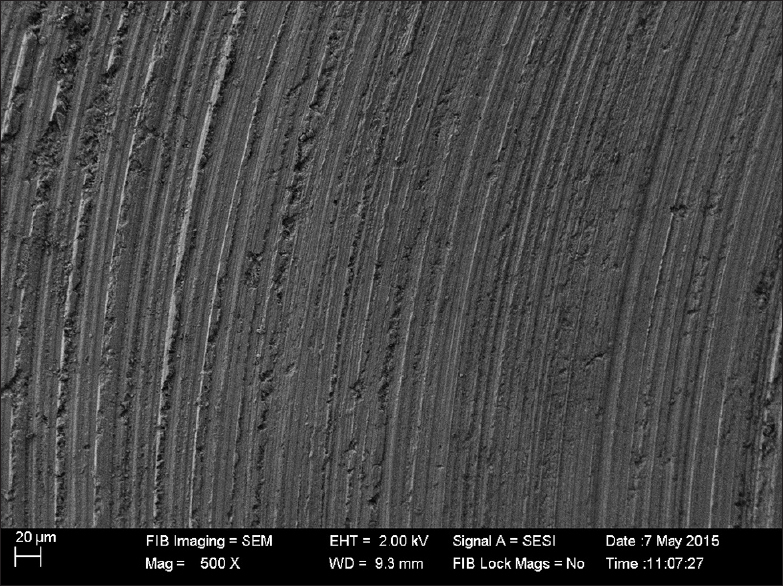 and Yiu et al., There is micromorphologic difference in dentin cut by diamond and carbide rotary instruments., A thick smear layer containing cut collagen fibers and hydroxyapatite crystallites was created with coarse diamond bur., Thicker smear layer prevents the effective contact between the dentinal tissue and the restorative material, thus poses a challenge for penetration and impregnation of the underlying dentin by adhesive monomers., Oliveira et al. observed that thicker smear layer interferes with the adhesion capabilities of the self-etching primer, suggesting that thin smear layer created by the carbide bur should be treated with self-etching primer for effective bonding. On the contrary, Rocha et al. and Young et al. reported that use of diamond burs for dentinal surface preparation resulted in higher bond strength., The SBS values of two self-adhesive flowable composites were lower than that of the Tetric N Flow on the dentine surfaces prepared with both diamond and carbide burs. This is in agreement with the findings of Rubens et al., İşman et al., Yuan et al., and Tuloglu et al. Constic did not show statistically significant values between carbide and diamond surface preparation. Constic contains methacrloxydecyl dihydrogen phosphate (MDP) along with bisphenol A-glycidyl methacrylate, ethoxylated bisphenol A dimethacrylate (EBADMA), urethane dimethacrylate, 2-hydroxy ethyl methacrylate (HEMA), triethylene glycol dimethacrylate (TEGDMA), and 1,6-hexanediol dimethacrylate (HDMA) monomers. MDP monomer holds longer and more hydrophobic spacer chains compared to the GPDM monomer present in Dyad-Flow. MDP was found to form stable 10-MDP-calcium salts without causing strong decalcification, which leads to strong chemical bonding with hydroxyapatite. Since there is no difference in bond strength between carbide and diamond groups, it is presumed that the thickness of the smear layer created by the burs does not influence the bonding of Constic to the dentin. Dyad-Flow showed statistically significant higher values of SBS for carbide burs than diamond burs. Dyad-Flow contains GPDM adhesive monomer, a phosphate functional group which has an acidic phosphate group for etching the tooth structure and two methacrylate groups for co-polymerization with other methacrylate monomers to provide increased cross-linking density and enhanced mechanical strength for the polymerized adhesive. Dyad-Flow bonds to the tooth in two ways: primarily through the interaction of phosphate functional group with calcium ions of the tooth and secondarily through micromechanical bonding as a result of an interpenetrating network formed between the polymerized monomer of Dyad-Flow and collagen fibers of dentin. The etching potential of the functional group may not be sufficient enough to penetrate the thick, coarse smear layer resulted after diamond bur preparation, thus influencing the bond strength, which is in agreement with the findings of Isman et al. Within the limitations of this study, it can be concluded that self-adhering flowable composites could not achieve comparable bond strength compared to the traditional flowable composites that are used along with the bonding agent. Constic did not show any difference in the bond strength with the dentinal surfaces prepared with tungsten carbide and diamond bur. However, Dyad-Flow and Tetric N Flow showed higher bond strength to the dentinal surface prepared with the tungsten carbide bur than the diamond bur, implying that the bond strength of the adhesive material is material dependent. Further clinical studies are required to confirm the bond strength of these self-adhering flowable composites. Ferracane JL. Resin composite – State of the art. Dent Mater 2011;27:29-38. Baroudi K, Rodrigues JC. Flowable resin composites: A systematic review and clinical considerations. J Clin Diagn Res 2015;9:ZE18-24. Dias WR, Pereira PN, Swift EJ Jr. Effect of bur type on microtensile bond strengths of self-etching systems to human dentin. J Adhes Dent 2004;6:195-203. Kaviani A, Ahmadzadeh A, Shahroie J, Ghasemi Z. Effects of diamond and carbide burs on dentin bond strengths of self-etch bonding systems. JIDAI 2013;25:57-61. Barros JA, Myaki SI, Nör JE, Peters MC. Effect of bur type and conditioning on the surface and interface of dentine. J Oral Rehabil 2005;32:849-56. Gwinnett AJ. Smear layer: Morphological considerations. Oper Dent Suppl 1984;3:2-12. Ogata M, Harada N, Yamaguchi S, Nakajima M, Tagami J. Effect of self-etching primer vs. phosphoric acid etchant on bonding to bur-prepared dentin. Oper Dent 2002;27:447-54. Yiu CK, Hiraishi N, King NM, Tay FR. Effect of dentinal surface preparation on bond strength of self-etching adhesives. J Adhes Dent 2008;10:173-82. Hosoya Y, Shinkawa H, Suefiji C, Nozaka K, García-Godoy F. Effects of diamond bur particle size on dentin bond strength. Am J Dent 2004;17:359-64. Di Nicoló R, Shintome LK, Myaki SI, Nagayassu MP. Bond strength of resin modified glass ionomer cement to primary dentin after cutting with different bur types and dentin conditioning. J Appl Oral Sci 2007;15:459-64. Nakabayashi N, Saimi Y. Bonding to intact dentin. J Dent Res 1996;75:1706-15. Peerzada F, Yiu CK, Hiraishi N, Tay FR, King NM. Effect of surface preparation on bond strength of resin luting cements to dentin. Oper Dent 2010;35:624-33. Oliveira SS, Pugach MK, Hilton JF, Watanabe LG, Marshall SJ, Marshall GW Jr., et al. The influence of the dentin smear layer on adhesion: A self-etching primer vs. a total-etch system. Dent Mater 2003;19:758-67. Rocha PI, Borges AB, Rodrigues JR, Arrais CA, Giannini M. Effect of dentinal surface preparation on bond strength of self-etching adhesive systems. Braz Oral Res 2006;20:52-8. Young GL, Moon SR, Young GC. Effect of cutting instruments on the dentin bond strength of a self-etch adhesive. J Korean Acad Conserv Dent 2010;35:13-9. Rubens NG, Andrey EM, Beatriz SS, Bruna MG, Camila PP, Gabriela SL, et al. Bonding performance of a self-adhering flowable composite to substrates used in direct technique. Rev Sul Bras Odontol 2013;10:343-9. İşman E, Karaarslan ES, Okşayan R, Tunçdemır AR, Üşümez S, Adanir N, et al. Inadequate shear bond strengths of self-etch, self-adhesive systems for secure orthodontic bonding. Dent Mater J 2012;31:947-53. Yuan H, Li M, Guo B, Gao Y, Liu H, Li J, et al. Evaluation of microtensile bond strength and microleakage of a self-adhering flowable composite. J Adhes Dent 2015;17:535-43. Tuloglu N, Sen Tunc E, Ozer S, Bayrak S. Shear bond strength of self-adhering flowable composite on dentin with and without application of an adhesive system. J Appl Biomater Funct Mater 2014;12:97-101. Wang R, Shi Y, Li T, Pan Y, Cui Y, Xia W, et al. Adhesive interfacial characteristics and the related bonding performance of four self-etching adhesives with different functional monomers applied to dentin. J Dent 2017;62:72-80. Available from: http://www.kerrdental.com/vertiseflow. 2016. [Last accessed on 2016]. ISO. Dental Materials: Testing of Adhesion to Tooth Structure. Technical Specification; 2003. Heintze SD. Clinical relevance of tests on bond strength, microleakage and marginal adaptation. Dent Mater 2013;29:59-84.